From the author of The Book of Lost Fragrances (read my review) comes a haunting novel about a grieving woman who discovers the lost letters of novelist Victor Hugo, awakening a mystery that spans centuries. I have loved this series from the beginning, so had to grab this book as soon as it became available! Jacinthe (Jac) L’Etoile returns in this sequel to The Book of Lost Fragrances. This time she is drawn to the Isle of Jersey by Theo Gaspard, an old friend from her days at the Blixer-Rath Institute where the two teens were treated for psychological problems. (Jac had psychotic episodes that may or may not have been past life flashbacks while Theo was suicidally depressed.) Malachi Samuels, Jac’s therapist from Blixer-Rath, warns her not to go. She’s vulnerable after losing her chance to be with the man she loves (in previous book). Malachai fears that Theo is dangerous to Jac. But as usual, there is a lot Malachai is not telling Jac. Theo claims to have knowledge of a lost manuscript by Victor Hugo, one that involves his explorations into the spiritual realm after the loss of his daughter Leopoldine. Jac can never resist a puzzle or a chance to explore ancient ruins, of which Jersey has an abundance. Against Malachi’s advice, she travels to the isolated island where she learns more about Theo and that confusing time at the clinic and also has visions of another time on the island when it was inhabited by Druids. The book alternates between the contemporary story and excerpts from an imaginary journal by Victor Hugo about his experiences with the spirit world: seances and mysterious visits from The Spirit of the Sepulchre, aka Lucifer. Seduction is quite different from the other books in the series, which alternate between fast-paced thrillers and past life memories. 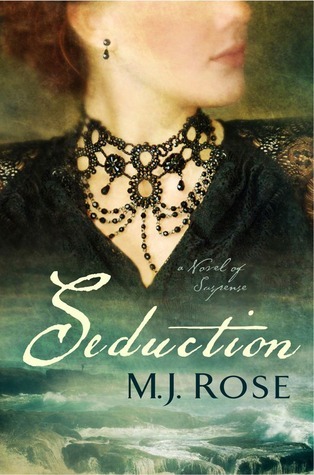 Seduction is more Gothic mystery than thriller–atmospheric, slower paced, rich in sensory detail and psychological angst. MJ Rose seduces her reader into the inner lives of her characters in all their psychological and spiritual complexity. In the afterword, she explains that she wrote the book in longhand, with an old-fashioned fountain pen,but doesn’t remember writing it. Perhaps she was channeling the spirit of Daphne du Maurier? I recommend the book for lovers of Gothic or paranormal fiction. While it’s not necessary to read the entire series to enjoy Seduction, I do think it would be helpful to first read The Book of Lost Fragrances, just to understand Jac and her world a bit better. First posted at Flights-a-Fancy 6/5/13. This entry was posted in Recycled Reviews, Uncategorized and tagged Guernsey, MJ Rose, paranormal, recycled reviews, reviews, Seduction by Linda / Lyndi. Bookmark the permalink.